I'm used to living my life in a bikini and I'm definitely not bikini-ready. I think the chubbiness is all relative, but it's for the very best cause in the whole world, and I'm proud of it. I'm just going to stay off the beach for a while, how about that? At the Athens Olympics in 2004, Kerri Walsh and her partner Misty May-Treanor won their first gold medal. They repeated the feat this summer, defending their title against the Chinese team. She started playing volleyball in high school and continued when she attended Stanford University, becoming a co-National Player of the Year in 1999. She met Jennings in 2000. Casey Jennings is also a beach volleyball player and has been married once before to Hillary Clark. 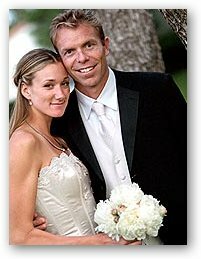 She married Walsh in 2005.